This is the second story of a month-long series commemorating anniversaries of significant moments in Woodland and Naugatuck sports history. 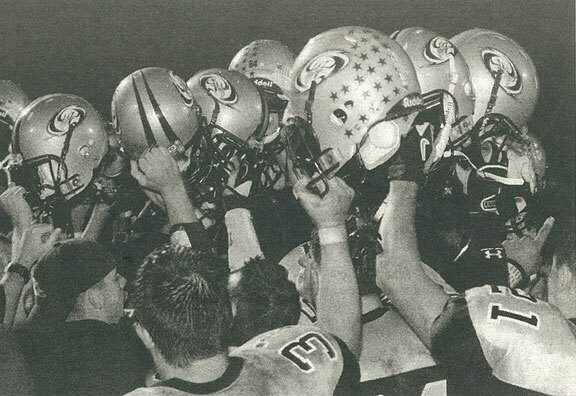 Our second story looks at the 15-year anniversary of Woodland’s upset of Naugatuck in a Halloween 2003 football classic. 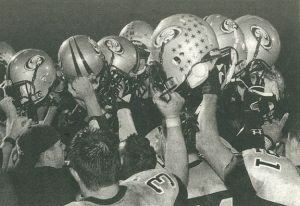 Fifteen years after arguably the most important game in the rich history of Woodland football, Chris Anderson still has trouble grasping what happened on Halloween of 2003. The game was a massive opportunity for the Hawks, the third-year program that had a 5-2 record during its first campaign as a member of the Naugatuck Valley League. Naugatuck entered with a 6-1 mark, and the game might have been even bigger had Woodland not suffered a 26-19 loss to Wilby the prior week without injured quarterback Jared Katchmar. With the ankle injury he suffered two weeks prior against Watertown still nagging, Katchmar wasn’t sure if he was going to be able to play against Naugy. Katchmar was able to play and had the game of his career, completing 23 of 44 passes for a then-NVL record 437 yards and four touchdowns. Pat Krakowski also recorded career-highs with 11 catches for 177 yards and added three total touchdowns. Early in the game, Anderson decided to move Krakowski from the backfield to the flanks. A back-and-forth fourth quarter saw the score skyrocket from 18-14 to 37-34. Naugatuck’s Darryl White (15-for-28, 260 yards) and Matt Gomes (11 catches, 190 yards) kept up with Katchmar and Krakowski. Katchmar delivered an 11-yard touchdown pass to Jason Kymer to give the Hawks a 34-31 lead with 1:29 to play. White led the Greyhounds right back into the lead when he handed to Sean McConologue for a 5-yard touchdown run with 32 seconds remaining. The problem for the ‘Hounds, of course, was that they left too much time on the clock. “We knew it was going to come down to who had the ball last,” Krakowski said in a 2013 interview. The game wouldn’t be nearly as legendary had Katchmar and Krakowski not pulled off their remarkable final drive. Katchmar said the stubbornness of Naugatuck’s defense allowed Woodland to be in the game. Krakowski caught a screen pass on the first play of the final drive and ran 41 yards to the Naugatuck 16-yard line. Offensive lineman Mike Stankus recalled in 2013 the pressure he felt on the offensive line. Katchmar missed on his next three attempts to set up an all-or-nothing fourth-down play at the 16 with 7 seconds remaining. Anderson, who called plays that year from above the field, dialed up another five-wide formation that had Krakowski set to run a post-corner route from the outside. Katchmar found Krakowski in the end zone for the game-winning 16-yard touchdown pass as time expired to give Woodland a 40-37 win. “Next thing I know, everybody’s on top of me,” Krakowski said. Although the Hawks missed out on the state playoffs that season with their loss to Seymour on Thanksgiving eve, Anderson noted the importance of beating Naugatuck. Now, 15 years later, the major figures of that game are scattered around the state and the country. But they still relish every chance to remember how special that night was for them.